The Warmth Of The Sun (compilation) (2007), Surfin' Safari (this album) (1962), Little Deuce Coupe (1963), Good Vibrations: Thirty Years Of The Beach Boys (compilation) (1993), The Greatest Hits – Volume 1: 20 Good Vibrations (compilation) (1999), Made In U.S.A. (compilation) (1986), Best Of The Beach Boys Vol. 2 (compilation) (1967), Stars And Stripes Vol. 1 (1996), The Capitol Years (compilation) (1980), Live - The 50th Anniversary Tour (2013). 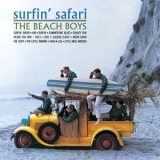 1962 THE BEACH BOYS "SURFIN' SAFARI", "409" 45 rpm 7"
Showing latest 5 ratings for this track. | Show all 31 ratings for this track. Related links: top tracks by The Beach Boystop tracks of the 1960s, top tracks of 1962.